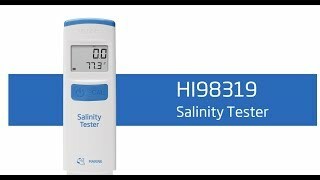 The Hanna Instruments Marine Salinity and Temperature Tester (HI98319) was designed to simplify testing your salt mix`s salinity and temperature in seconds, with reading results in parts per thousand (ppt), Practical Salinity Units (PSU), or specific gravity (S.G.). 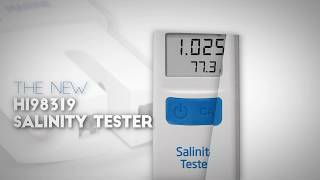 This waterproof tester uses a graphite amperometric conductivity probe, which is resistant to oxidation, improving the measurement repetition to determine the salt content in the water. The use of a graphite probe also reduces the polarization effect common with testers that use two stainless steel pins. Calibration is performed by pressing the dedicated calibration button. Once in calibration mode, the probe is placed in 35.00 ppt calibration standard. When the standard value is recognized and stability reached, the meter will automatically accept and store the value. The Hanna Marine Salinity Tester displays the readings along with temperature on an easy to read large LCD screen. With an onscreen stability indicator you can be confident in the reading results. The included auto-off feature will save energy, lengthening your battery life. Perfect size for on-the-go testing. With large LCD screen, you will be able to view the readings at a glance from any angle. The CR2032 Li-ion battery will provide up to 100 hours of use. The battery icon will blink when it is time to change the battery. Graphite sensors reduces polarization effects and does not oxidize, giving you a more reliable and accurate reading. The design of this tester can withstand drops, knocks, and spills. Conductivity measurements are highly sensitive to temperature variations, which the exposed temperature sensor helps compensate for. The temperature probe takes these variations into consideration to ensure accuracy. Resolution 0.1 ppt (g/L); 0.1 PSU; 0.001 S.G. So much easier than other methods to read salinity. I love how easy it is to calibrate and so quick to check all my tanks. No more having to read a small scale under light! Fast, easy to use, great support from MD and Hanna. Hard to dry after use because of the little holes. Easy to use and seems to be accurate just hard to dry before storing. Small, digital, easy to calibrate. Small easy to calibrate, works well. and good salinity result.